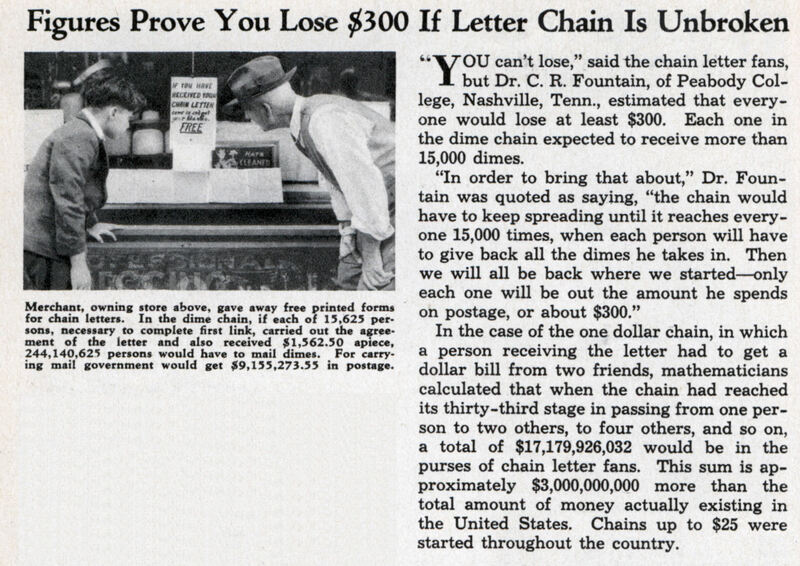 You can’t lose,” said the chain letter fans, I but Dr. C. R. Fountain, of Peabody College, Nashville, Tenn., estimated that everyone would lose at least $300. Each one in the dime chain expected to receive more than 15,000 dimes. In the case of the one dollar chain, in which a person receiving the letter had to get a dollar bill from two friends, mathematicians calculated that when the chain had reached its thirty-third stage in passing from one person to two others, to four others, and so on, a total of $17,179,926,032 would be in the purses of chain letter fans. This sum is approximately $3,000,000,000 more than the total amount of money actually existing in the United States. Chains up to $25 were started throughout the country.